Thai Prime Minister Says 'Main Suspect' In Bangkok Bombing Arrested : The Two-Way Authorities say a second foreigner has been arrested in connection with last month's deadly bombing and that three more arrest warrants have been issued. 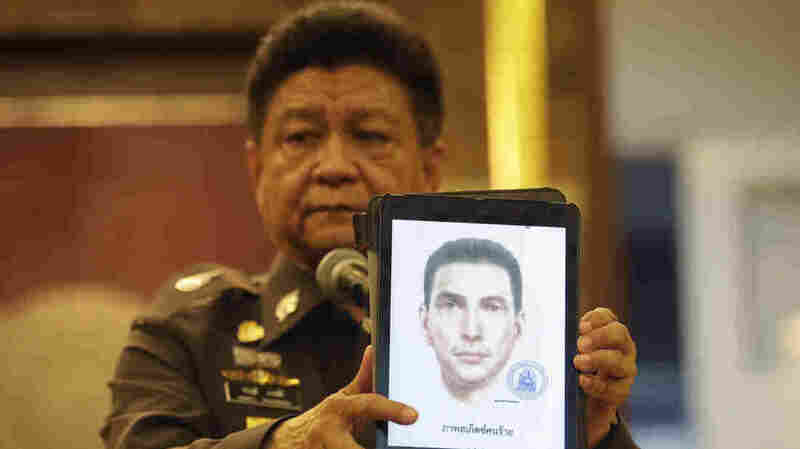 Police spokesman Lt. Gen. Prawuth Thavornsiri shows a photo of one of three men for whom Thai authorities have issued new arrest warrants in connection with the bombing case. Police in Thailand have arrested a second foreign man — who Prime Minister Prayuth Chan-ocha said is the main suspect — in connection with the deadly Bangkok bombing on Aug. 17, Michael Sullivan reports for NPR. Prayuth told reporters the man arrested Tuesday was taken into custody in eastern Thailand, near the border with Cambodia, and that the suspect may have been attempting to flee the country, Sullivan reports. "Prayuth said the man is not Thai and is believed to be the main suspect in the bombing" Sullivan says. But officials don't know whether he is the yellow-shirted man seen on surveillance video leaving a backpack at Bangkok's Erawan Shrine on the day of the bombing. The Associated Press reports that Prayuth said the suspect resembles the man in the yellow shirt. Sullivan reports that Prayuth said fingerprints and DNA testing will be done to determine whether the man is the bomber. He has not been publicly identified by name or by nationality. "It would be great if he were [the bomber]. Then we will know who they are, where they came from, who's behind this," Prayuth said, according to the AP. Police made their first arrest in the case on Saturday, when they detained a foreign man who they say had bomb-making materials in his apartment. Then on Monday, arrest warrants were issued for two more people: a 26-year-old Thai woman named Wanna Suansun and another foreign man, after police reported finding materials that could be used to make bombs in a room allegedly rented by Suansun. Neither of those suspects has been apprehended yet, although Reuters reports that Suansun has agreed to meet with police. At a news conference Tuesday, national police spokesperson Prawuth Thavornsiri reiterated that the man arrested was "a main suspect in the case" and also announced that "three new arrest warrants have been issued in connection with the case, bringing the total to seven," according to the AP. The news service reports that "two were named persons — [Prawuth] could not provide spellings for the names of the men, whose nationalities were unknown — while the third was not identified by name but was described as a Turkish national. He displayed pictures of the three on a tablet computer." The blast killed 20 people and injured more than 100 others at the popular Hindu shrine in the Thai capital. So far, no individual or group has claimed responsibility for the attack, which Thai authorities say was not an act of terrorism, but an effort to damage Thailand's economy.